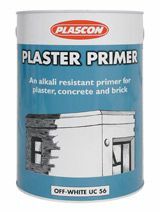 Plascon Plaster Primer is a solvent based primer for gypsum and masonry surfaces. It acts as a good barrier between the new alkaline plaster and the painted topcoats. It can also be used as a binding agent for too soft or too powdery plaster, as well as a sealer on incredibly porous surfaces. It has a matt appearance with a spread rate of 8 m²/ℓ and comes in white. (Take note spreading rate may differ due to the condition of the surfaces being primed). Can be used as binding and sealing coat and brittle cement plaster, as well as paperface board, brickwork, softboard and gypsum plastered surfaces. Can be applied as a primer coat to interior and exterior cement plaster, concrete and fibre-cement. Protection of subsequent coats (alkyd paints) against saponification. This primer promotes good adhesion. Can be used with both solvent-based and water-based top coats. Plascon Primer can be applied by brush, roller or spray. It is available in white and drying time is usually 4 hours. Before applying the primer, ensure that the surface is clean and completely dry and free from oil, dust or other contaminants. Tools can be cleaned with turpentine. This product is however not recommended for areas where high alkalinity is expected.